The Eaglevision requires a voltage of 24.0 volts. The active voltage must never exceed 26.4 volts, the voltage should preferably be 22 to 24 volts. The freely rotating motor is operated at about 0.3 amps under load max. 1. The Eaglevision is controlled through a switch already on the machine. If you would be interested in receiving more information, or would like to make a consultation appointment with us, please click here. The Eaglevision is a stroke of genius that we created. As our patented innovation, this safety plate with integrated pivot window, allows the user to view inside the machine and guarantees a complete perspective. Why, you ask? Due to the speed of the rotatory plate, it is able to counteract all possible burning debris and coolants so that user has a constant visibility and can see through the glass. according to your specifications, we can provide various, tailored variants of mechanical sheets which have an integrated rotary table. Alternatively, we can fit several turn tables onto one single sheet. 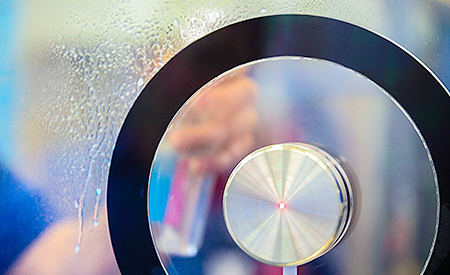 With Eaglevision we are able to fulfill even the most unusual customer requirements such as a plasma coating of a glass surface area to aluminum abrasion surfaces or even Borosilicate glass, used to counteract hot debris. It's design and texture makes Eagle Vision perfect for sliding doors with internal scrapers.